What’s the case for the traditional home wall mounted thermostat or a Smart Thermostat, are they dead? 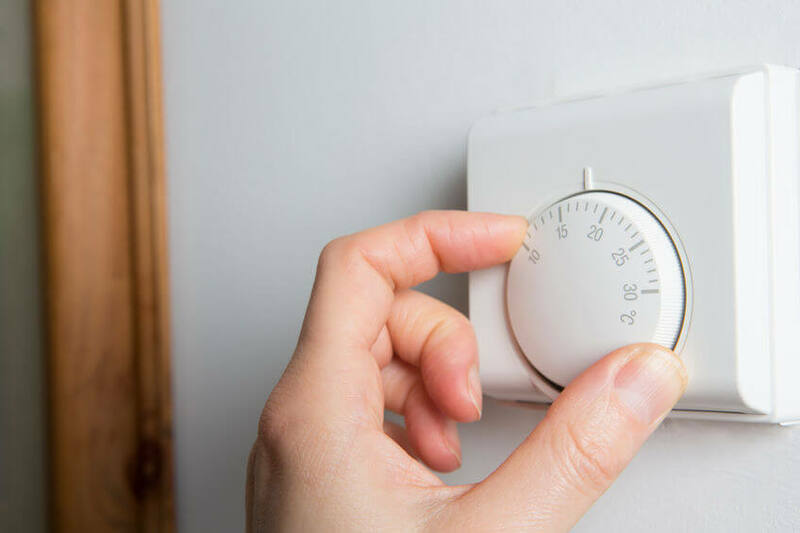 Since central heating systems were first installed into homes in the 50’s & 60’s there has been a thermostat somewhere in the house to control the temperature. By modern standards this approach to heating a home no longer makes sense, to think that you can measure the temperature in just one room in the house and use that to assume the temperature in all the other rooms feels a bit old school. This prehistoric approach is why you have such varying temperatures across the house, each room has its own levels of insulation and heat efficiency so heats up and cools down at a different rate to any of the other rooms. You often find the room that the thermostat is in is at 22 degrees but other rooms can be up to 10 degrees different from that room, which is the difference between being sat in a T-shirt and sat in your coat. So why do most homes still do this and why have lots of so called smart thermostats, yes we are looking at you Nest, just copied this approach? This is a hang over from when houses were smaller, so if you had a 2 up 2 down then the chances are the temperature was roughly the same across the rooms. Today’s modern houses with extensions and conservatories means that this is no longer the case and you often have different building materials and insulation used in different parts of the house making it even harder to have a single temperature. The reason why most smart thermostats’s copied this approach was probably because having a so called smart thermostat was going to be a change for lots of people and therefore they tried to closely match what people already had. While this may make sense for customer adoption it makes no sense for more efficiently heating houses. 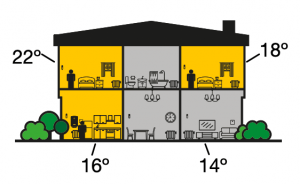 If you have an extension on your house using modern building materials and modern insulation then it is going to heat up quicker and retain heat better than an older part of the house, this in turn means that it will have reached 22 degrees long before the other rooms but because the heating system is still trying to get the room where the thermostat is positioned up to 22 degrees it will continue to heat all rooms. This results in overshoot, so your new extension room ends up at 25 degrees (wasting energy and costing money). The next thing that happens is a person sat in the extension goes and turns down the thermostat because they are too hot, one hour later someone in another room is turning it back up because they are too cold. We now have a yoyo effect on the house temperature. This is just a crazy way to control heating in a house, yet most traditional systems are exactly like this and most smart thermostats do nothing to solve this fundamental issue. The Google Nest for example is just a pretty looking thermostat that replaces your existing wall mounted thermostat, it still measures the temperature where it is sat and has no clue about the temperature in any of the other rooms. They have done plenty for convenience so you can now turn your heating on from anywhere in the world via a mobile app but they have done little to change the way we actually heat our homes. If you want to save money and energy you have to change the way you heat your house not just change the way you turn it off or on. How do we have a truly smart heating system for our house? We measure the temperature in every room and only heat the rooms that are required, this saves energy and therefore money. The Nest & Hive can’t do this unless you put a thermostat in every room which would be crazy expensive and they are just not designed to have lots of thermostats attached so wouldn’t work. You need a full smart heating system like Genius Hub which is designed to have one or more temperature readings from each room in the house and make intelligent decisions on which rooms to heat. Whether you have a room thermostat, a room sensor, a smart radiator valve, an electric switch or all of theses in a room the Genius Hub will use one of them to determine the room temperature (or you select the one you want it to use, its called temperature hierarchy). The Smart Thermostat is dead! If you have a house with 4 or more bedrooms then a Smart Thermostat solution like the Nest or Hive is really not going to cut it, while it maybe an improvement on convenience from an old style thermostat it doesn’t provide you the benefits of a Smart Heating System like Genius Hub. Yes a smart heating system costs more the a smart thermostat or old fashioned wall thermostat but it is like comparing a bike with an electric car. Once you have invested in a smart heating system for your house there is no looking back. Bring your house’s heating into the latest century with the Genius Hub cutting edge technology, design and price a system for your house using our create your system.